1. Reserve 1 table­spoon of sal­sa. Mix sal­sa and chopped meat in fry pan and heat togeth­er. 2. Place one tor­tilla in the bot­tom of a small casse­role dish. 3. Spread one half of the sal­sa mix­ture on the tor­tilla. 4. Sprin­kle shred­ded cheese on top. 5. 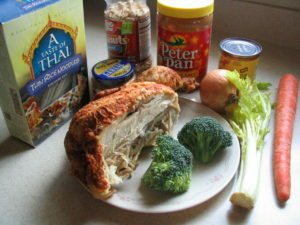 Repeat 2–4 (plac­ing anoth­er tor­tilla on top of the one below, then cov­er­ing with cheese. 6. Place last tor­tilla on top, spread the reserved sal­sa, then sprin­kle more shred­ded cheese. 7. Heat in 350̊ oven 20 or more min­utes until cheese bub­bling and top slight­ly browned. 8. Cut in wedges and serve with sour cream, chopped let­tuce, and chopped toma­to. Notes: Any meat may be used — beef, pork, chick­en, ham, even fish. Cheeses may include ched­dar, moz­zarel­la, Col­by, Parme­san, Mex­i­can blends, or oth­ers. 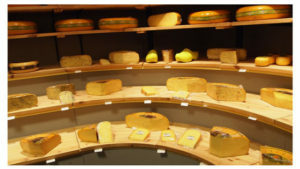 You may pre­fer to place a dif­fer­ent cheese in each lay­er. Vari­a­tions: Use pineap­ple sal­sa and include pineap­ple tid­bits with the meat. Use a chopped, cooked veg­etable instead of meat, or with meat.